This is the Double Smoothed Momentum as presented by William Blau- see Stocks & Commodities, May 1991 for additional information. Like the Double Smoothed Stochastic Oscillator, Blau’s Double Smoothed Momentum plot on a range from 0 to 100, applying the same rules of interpretation. Generally, plots above the 70 threshold indicates an overbought scenario, whereas values below 30 indicate oversold. If the Double Smoothed Momentum plot has been moving below the 30 level and crosses the signal line, it can be interpreted as a buy signal. Conversely, if the oscillator has been above the 70 level and crosses below the signal line, it can be taken as a sell signal. 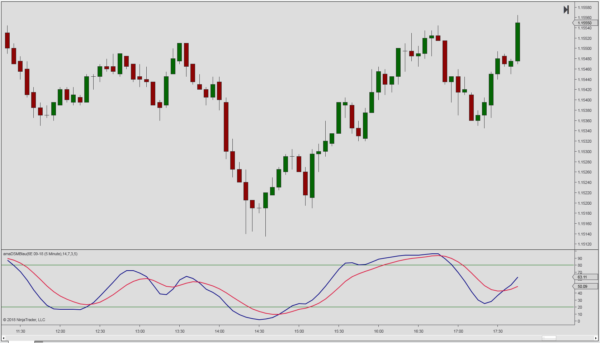 The raw Stochastics is calculated as the percentage value for the close within the range created from the highest close and the lowest close over the lookback period. The term Double Smoothed Momentum is somewhat misleading. The DSM-B is obtained by separately double-smoothing both numerator and denominator of the raw Stochastics. The double-smoothed value for the numerator is then divided by the double-smoothed value for the denominator. William Blau applied an EMA two time, both as numerator and denominator of the raw Stochastics. 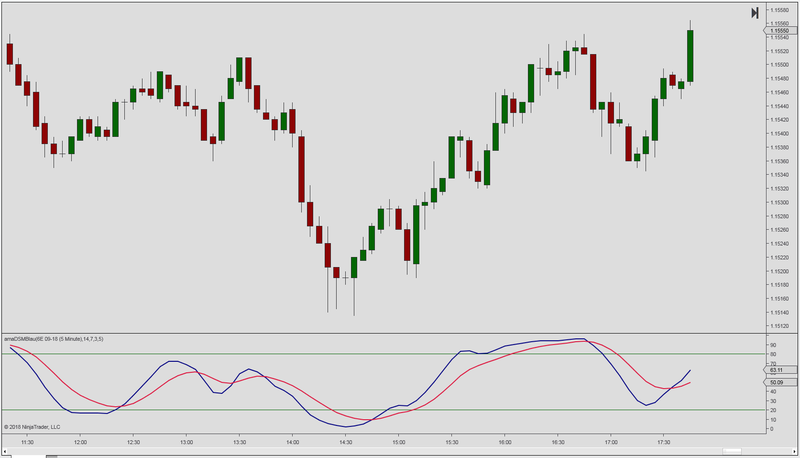 Parameters: The lookback period for the raw Stochastics indicates the number of bars for which the highest close and lowest close is determined. The lookback period is comparable to all other Stochastics indicators. The default value is 14 bars. The double smoothing of numerator and denominator is done with two moving averages. The first smoothing is typically done with a faster moving average, the second with a slower moving average. Signal line: William Blau did not use a signal line for the double smoothed indicators. We have added one as the cross of the signal line can be used for trend indication.